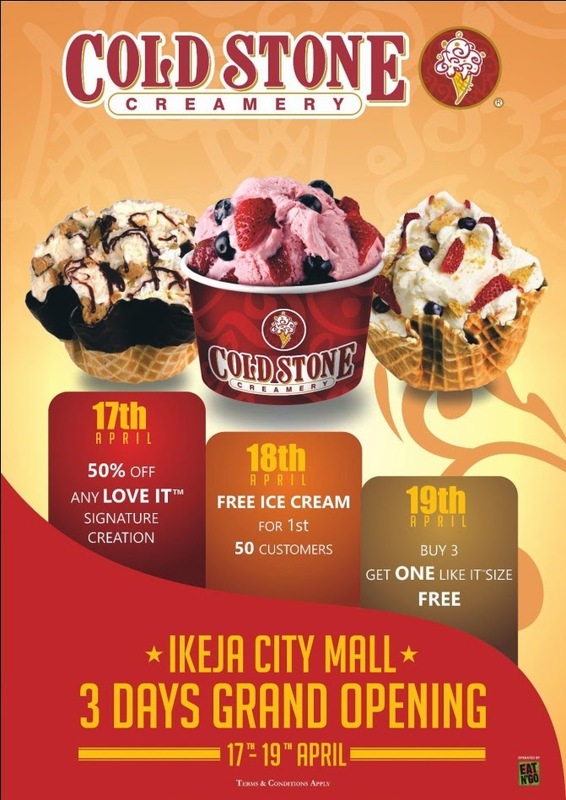 Cold Stone Creamery Ikeja City Mall store will be giving free ice cream and discounts at her three (3) day grand opening ceremony. · Day 2 (Saturday, 18th April) offers FREE ICE CREAM for the rest of THE YEAR to the FIRST 50 CUSTOMERS to make an ice cream purchase. Cold Stone is an international brand with over two decades of selling premium, great tasting ice cream globally (over 2 years in Nigeria). As the brand promise suggests, it’s not just another ice cream, it is the “Ultimate Ice Cream Experience”.